I like Jeffrey Combs, I’ve even found a that I enjoy camp bloody horror like “Hellraiser” or “The Thing” the thing is this film is unlike either of those in storytelling. There are certianly aspects of the film I liked, but the focus is all wrong. We follow the most uninteresting couple when there is the prime candidate to tell an interesting story right there…Herbert West. The film was directed by Stuart Gordon who also co-wrote the script along with William J. Norris and Dennis Paoli. 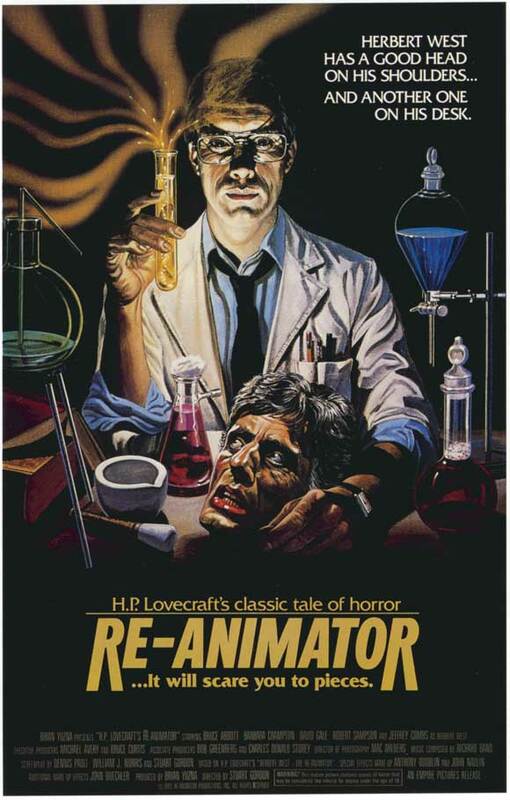 Brian Yuzna produced the film and it is based off the story Herbert West-Reanimator by H.P. Lovecraft. The story involves a medical student named Dan Cain (Bruce Abbott) taking in Herbert West as a roommate. Things soon get more complicated as his fiance Megan (Barbara Crampton) is the daughter of the Dean of the College as Dan finds himself pulled into Herbert’s experiments in reanimation of the dead. The Pros: The Premise – The premise is pretty cool. Any movie with a mad scientist immediately has potential to explore the depths of mortality and why a person would want to bring back the dead or escape death…sadly we don’t get any reasons behind why Herbert West does what he does, but the premise gives us the potential for more. The Special Effects – The Special Effects are great! We get to see a re-animated cat, head and a few zombie bodies as well. This is really where the movie works and I wish we’d gotten more of it since the writing is really bad when things aren’t being brought back to life. Herbert West – Jeffrey Combs can make anything good, even a poor script. 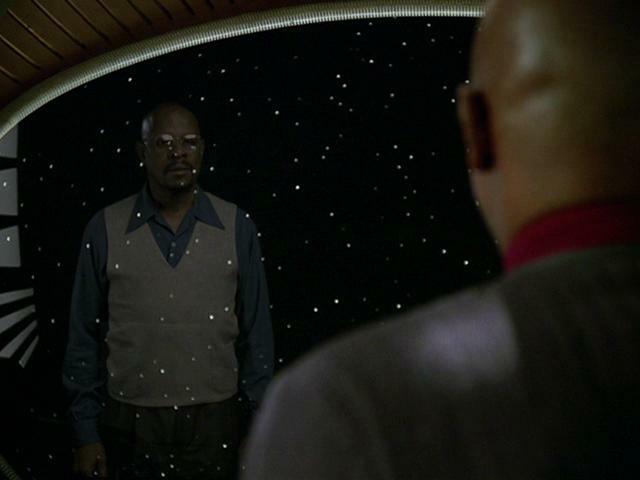 We never get his motivation but his passion shows why even he could see the smallest of roles in “Star Trek” and make them interesting. His character is the reason to watch this and his acting owns this film. The Ending – Dan the bland leads using re-animation to resurrect his dead fiance. That’s actually a pretty neat ending as the film establishes that being brought back warps your mind. Cons: The Antagonists – Whether it’s the Dean or Dr. Hill these are men who only live to control and the reasons behind their insecurity and bullying is never explored in any way. They are crappy villains that bring down the story. Megan – All she does is scream and she is only written into this film to be creeped on by all the male characters. She is nothing more than a prop that drives the protagonist (Dan) and antagonists’ (The Dean and Dr. Hill) actions. The Structure of the Film – The structure begins with the past and Herbert West trying to bring back his mentor Gruber. It is so different from the rest of the film I am not sure why it was put in as West shows on multiple occasions he doesn’t care about people just what he can do with them after they are dead. From here we follow Dan’s story and it just goes down from there…so West’s motivations aren’t fully established and we have a weak lead…the hook fails causing the rest of the film to be weak in the process. This is a film that is alright and worth checking out if you are a fun of Jeffrey Combs and Lovecraft as I am. Sadly neither are given the chance to fully be in a masterpiece of his work as the film falls flat on a few occasions and the blandness of the leads and the antagonists only being one-dimension really brings the film down. For what it is worth though, I am curious if the other sequels are better.